Sale Alert! This shoe has just been reduced from $95 to $30. That's right, Dolce Vita lace-up espadrilles for only $30. 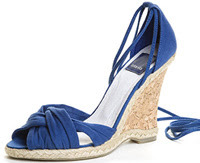 Gets ta steppin' in these criss-crossed cotton upper cork wedges. Wrap the thin shoe-string style laces 'round the ankle, or cross the laces up the calf for Greek-appeal.